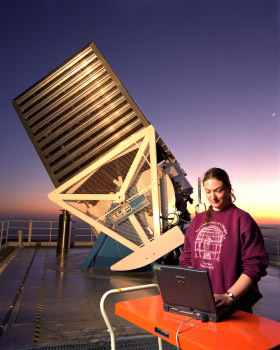 UCSC astronomer Connie Rockosi is one of the founders of the Sloan Digital Sky Survey. 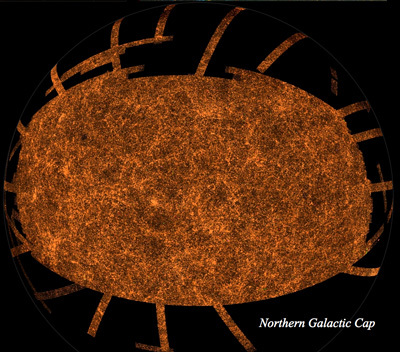 This map of the sky from the SDSS-III image shows the view toward the northern hemisphere of our galaxy. Visible in the map are the clusters and walls of galaxies that are the largest structures in the entire universe. Image credit: M. Blanton and the SDSS-III collaboration. The Sloan Digital Sky Survey III (SDSS-III) has released the largest digital color image of the sky ever made, and it's free to all. The image has been put together over the past decade from millions of 2.8-megapixel images, thus creating a color image of more than a trillion pixels. This terapixel image is so big and detailed that one would need 500,000 high-definition televisions to view it at its full resolution. "This image provides opportunities for many new scientific discoveries in the years to come," said Bob Nichol, a professor at the University of Portsmouth and scientific spokesperson for the SDSS-III collaboration. Connie Rockosi, associate professor of astronomy and astrophysics at UC Santa Cruz, is one of the founders of SDSS and principal investigator of a survey undertaken by the SDSS-III collaboration to study the properties and motions of hundreds of thousands of stars in the outer parts of our Milky Way galaxy. The survey, known as the Sloan Extension for Galactic Understanding and Exploration (SEGUE), started several years ago and has now been completed as part of the first year of SDSS-III. In conjunction with the image being released today, astronomers from SEGUE are also releasing the largest map of the outer galaxy ever made. "This map has been used to study the distribution of stars in our galaxy," Rockosi said. "We have found many streams of stars that originally belonged to other galaxies that were torn apart by the gravity of our Milky Way. We've long thought that galaxies evolve by merging with others; the SEGUE observations confirm this basic picture." The new image and map are at the heart of new data released by the SDSS-III collaboration at the 217th American Astronomical Society meeting in Seattle. The new data, along with the previous data releases from SDSS, gives astronomers the most comprehensive view of the night sky ever made. SDSS data have already been used to discover nearly half a billion astronomical objects, including asteroids, stars, galaxies and distant quasars. The latest, most precise positions, colors and shapes for all these objects are also being released today. "This is one of the biggest bounties in the history of science," said Professor Mike Blanton from New York University, who is leading the data archive work in SDSS-III. Blanton and many other scientists have been working for months preparing the release of all this data. "This data will be a legacy for the ages, as previous ambitious sky surveys like the Palomar Sky Survey of the 1950s are still being used today. We expect the SDSS data to have that sort of shelf life," Blanton said. The image was started in 1998 using what was then the world's largest digital camera: a 138-megapixel imaging detector on the back of a dedicated 2.5-meter telescope at the Apache Point Observatory in New Mexico. Over the past decade, the Sloan Digital Sky Survey has scanned a third of the whole sky. Now, this imaging camera is being retired and will be part of the permanent collection at the Smithsonian Museum in recognition of its contributions to astronomy. "It's been wonderful to see the science results that have come from this camera," said Rockosi, who started working on the camera in the 1990s as an undergraduate student with Jim Gunn, professor of astronomy at Princeton University and SDSS-I/II project scientist. Rockosi's entire career so far has paralleled the history of the SDSS camera. "It's a bittersweet feeling to see this camera retired, because I've been working with it for nearly 20 years," she said. But what next? This enormous image has formed the basis for new surveys of the universe using the SDSS telescope. These surveys rely on spectra, an astronomical technique that uses instruments to spread the light from a star or galaxy into its component wavelengths. Spectra can be used to find the distances to distant galaxies, and the properties (such as temperature and chemical composition) of different types of stars and galaxies. "We have upgraded the existing SDSS instruments, and we are using them to measure distances to over a million galaxies detected in this image," said David Schlegel, an astronomer from Lawrence Berkeley National Laboratory and principal investigator of the new SDSS-III Baryon Oscillation Spectroscopic Survey (BOSS). Schlegel explained that measuring distances to galaxies is more time-consuming than simply taking their pictures, but in return, it provides a detailed three-dimensional map of the galaxies' distribution in space. BOSS started taking data in 2009 and will continue until 2014. Once finished, BOSS will be the largest 3-D map of galaxies ever made, extending the original SDSS galaxy survey to a much larger volume of the universe. The goal of BOSS is to precisely measure how so-called "dark energy" has changed over the recent history of the universe. "Dark energy is the biggest conundrum facing science today," says Schlegel, "and the SDSS continues to lead the way in trying to figure out what the heck it is!" In addition to BOSS and SEGUE, SDSS-III is also undertaking two other surveys of our galaxy through 2014. The first, called MARVELS, will use a new instrument to repeatedly measure spectra for approximately 8,500 nearby stars like our own Sun, looking for the telltale wobbles caused by large Jupiter-like planets orbiting them. MARVELS is predicted to discover around a hundred new giant planets, as well as potentially finding a similar number of "brown dwarfs" that are intermediate between the most massive planets and the smallest stars. The second survey is the APO Galactic Evolution Experiment (APOGEE), which is using one of the largest infrared spectrographs ever built to undertake the first systematic study of stars in all parts of our galaxy; even stars on the other side of our galaxy beyond the central bulge. Such stars are traditionally difficult to study as their visible light is obscured by large amounts of dust in the disk of our galaxy. However, by working at longer, infrared wavelengths, APOGEE can study them in great detail, thus revealing their properties and motions to explore how the different components of our galaxy were put together. "The SDSS-III is an amazingly diverse project built on the legacy of the original SDSS and SDSS-II surveys," Nichol said. "This image is the culmination of decades of work by hundreds of people, and has already produced many incredible discoveries. Astronomy has a rich tradition of making all such data freely available to the public, and we hope everyone will enjoy it as much as we have."